Lazyweb: full list of Sony BMG owned domains? A non-spam comment recently arrived on the old Boycott Sony site, which is something of a rarity these days. Reader PJ asks whether there is a known list of sites that are owned by Sony BMG, or Sony generally, so that he can block those sites for showing up in AdSense ads. I don’t have such a list. Does anyone out there? I suspect that part of the issue may be that Sony Music/Sony BMG registers unique domains for its artists, meaning that blocking ads for them may turn into a game of whack-a-mole. But I’ll throw the question out to LazyWeb anyway. Via BoingBoing, this spectacular casemod brings memories of my childhood flooding back. My favorite Banana Jr. moment may still be the first strip: as the computer dances around the panel, Oliver Wendell Jones reads from the directions, “And most importantly… it turns off.” And the Banana Jr. collapses backwards, its feet up in the air, cartoon smoke coming from its case. 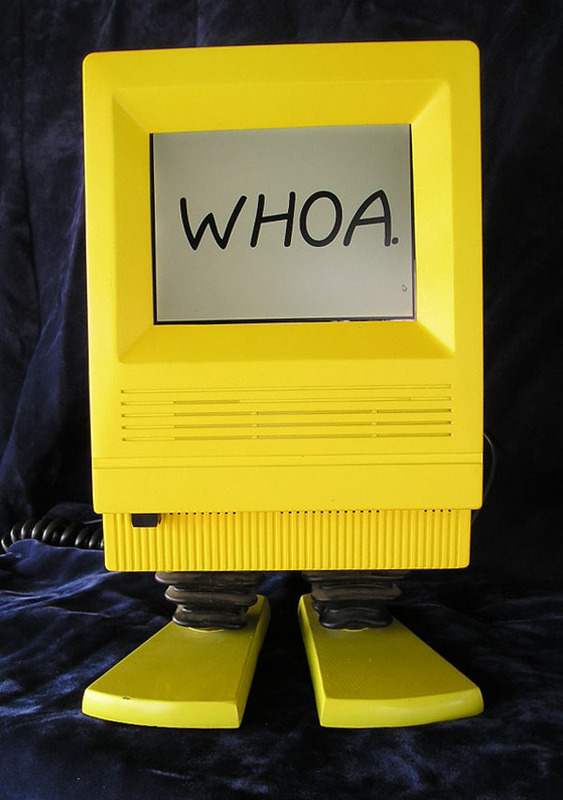 The Banana Jr. was a nice evenhanded mockery of personal computing in its day. Oliver Wendell Holmes was always hacking into remote systems (my fave: the New York Times headline “Reagan Calls Women ‘America’s Little Dumplins”), a quintessentially IBM PC activity. But the speaking, dancing computer was all Macintosh. I was almost disappointed when I got my SE/30 that the resemblance wasn’t closer. And Breathed was legendary for merchandising his characters everywhere (to the point that Opus made a joke about little plush versions of himself in one strip), but he missed a killer opportunity: stands for original Macs in the form of Banana Jr. legs. They would’ve been beautiful.